A study shows that ride-hailing services like Lyft and Uber contribute to traffic congestion. If there's one thing veteran Chicago taxicab driver Jay Khawas says he sees a lot of, it's cars with the familiar Uber and Lyft emblems. "Oh my God. Like, many, many," says Khawas. "They're everywhere." There certainly are more Uber and Lyft vehicles than taxicabs in Chicago and in most other big cities. Chicago, for example, limits the number of taxicab medallions, or vehicles licensed as taxis, to under 7,000. Meanwhile, the number of vehicles registered with the city for ride-hailing services topped 117,000 at the end of 2017, and city figures show that the number of "active" vehicles — those that provide four or more trips per month — at close to 70,000. Stopped at a light, Khawas points them out. There's an Uber in front of him, behind him and in the lane to his right. And he says he doesn't think it's just the sheer number of Ubers and Lyfts out there that are tying up traffic. He says he thinks they don't know the rules of the road and spend too much time looking at their phone for directions. It should surprise no one that cab drivers are upset with these ride-hailing services and there's new data to help explain why. A recent study shows that the explosive growth in those services is worsening traffic congestion in the country's nine biggest cities, and in many cases, that growth comes at the expense of cab drivers. "You see Uber and Lyft having eight or nine times as many trips as taxicabs in places like Chicago, so they've really decimated the taxi industry," says transportation consultant Bruce Schaller, a former deputy transportation commissioner for New York City, and author of the study. Schaller found that Uber, Lyft and other transportation network companies, or TNCs, transported 2.61 billion passengers last year, a 37-percent increase from 1.90 billion in 2016. The study indicates that TNCs added 5.7 billion miles of driving in the nation's nine largest metro areas. And Schaller says Lyft and Uber are not only hurting taxis, but they're also luring riders away from public transit. In many major cities, "We're seeing a drop in both bus and subway, or metro, ridership," says Schaller. In the nation's biggest cities, Schaller's study finds that up to 60 percent of those riding with Uber and Lyft-like services would have taken transit, biked, walked or would not have made the trip at all, if not for the availability of the ride-hailing services. He says many users don't own a car, so he contends Uber and Lyft are not taking other vehicles off the road. Schaller's study suggests that Ubers and Lyfts drive 2.8 new miles for every one mile saved by passengers not using their own car. He contends that the number drops only a small fraction, to 2.6 new miles driven, with services like UberPool or Lyft Line. A big reason is that the study shows those drivers spend much of their time behind the wheel without customers, waiting to be pinged to pick someone up. "The idea that having several people in the back [of the car] together, it intuitively makes sense" that it would reduce traffic congestion, says Schaller. "But the fact is that 40 percent of their time is spent between passengers and so that's all new mileage on the street, even if you're taking people who formerly drove." Are there any solutions to the congestion? "One is to put some types of limits on the number of Uber and Lyft vehicles that are in the really congested areas," Schaller explains. New York City is, in fact, considering doing just that. "And the other, and really critical thing, is to have frequent, reliable and comfortable public transportation." Chicago was one of the first cities to impose a tax on Uber and Lyft trips to help fund public transportation, something Schaller suggests other cities should consider doing, too. Lyft and Uber officials take issue with some aspects of the study. In an email, a Lyft spokeswoman says other "studies paint a very different picture than Schaller's claims." One suggests that traffic congestion declined 5 percent in the San Francisco Bay Area while Lyft trips grew 49 percent. And she says that "over 250,000 Lyft passengers gave up their personal cars because of the availability of rideshare." Uber says it agrees with Bruce Schaller's call for more efficient public transit, such as dedicated bus lanes, but the company calls Schaller's analysis of shared services like UberPool "fundamentally flawed." Other studies do show Uber-like services are indeed adding to traffic congestion. How much is not clear. P.S. 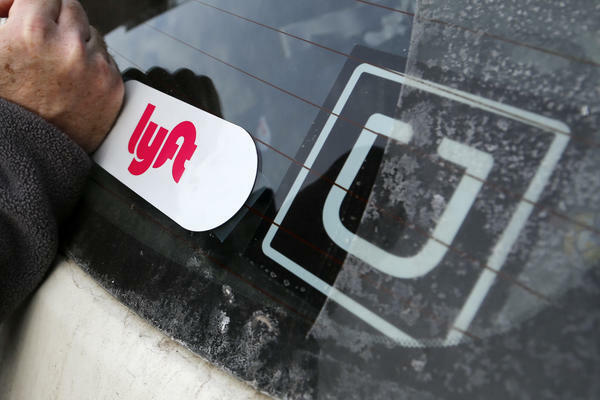 Siraj, who heads the Urban Transportation Center at the University of Illinois at Chicago, says Lyft and Uber are improving transportation access and providing more options for many people and that cities need to accommodate them. "Mobility becomes the key phrase nowadays," says Siraj. "You don't really worry about who's offering the trip, but how people are going from one place to another." So rather than restrict ride-hailing services, Siraj says cities need to actively work with them to better incorporate them into their transportation planning. "There's a time and a place for all of these modes, and it's just figuring out ways that they function the best. That's the million dollar question." That Uber or Lyft ride that you take tonight instead of driving your own car or taking mass transit, it is not reducing traffic congestion after all. In fact, the ride-hailing services are actually making traffic worse, according to a new study. And the report's author says that's even true of shared ride services like UberPool and Lyft Line. From Chicago, NPR's David Schaper reports. DAVID SCHAPER, BYLINE: If there's one thing veteran Chicago taxicab driver Jay Khawas sees way too much of, its cars with the familiar Uber and Lyft emblems. JAY KHAWAS: Oh, my God. Like, many, many. Like, you can see in a street one or two taxi - all 20, 25, is, like, an Uber or Lyft. SCHAPER: While that 20 to 1 claim may not be accurate, there's certainly way more Uber and Lyft vehicles than taxicabs in Chicago and most other cities. At a stoplight, Khawas points them out. KHAWAS: My front is Uber. Other one, Uber. Everywhere, all around, you can see, like, a lot of Uber in these streets. SCHAPER: And Khawas says all those Ubers and Lyfts are tying up traffic. KHAWAS: They don't know the rules part about how to drive and are making more traffic. Yep. SCHAPER: The Uber in front of us just stops halfway through the left turn in the middle of a busy intersection. KHAWAS: Yeah. Yeah. They block my streets, making more traffic. SCHAPER: It should surprise no one that cab drivers are down on rides hailed by smartphone apps. And there's new data to help explain why. BRUCE SCHALLER: You see Uber and Lyft having eight or nine times as many trips as taxicabs in places like Chicago. So they've really decimated the taxi industry. SCHAPER: Transportation consultant Bruce Schaller is a former deputy transportation commissioner for New York City. His latest study of the impact of these ride-hailing services shows that they transported 2.61 billion passengers last year, a 37 percent jump in just one year. And, he says, they're not only hurting taxis but taking riders away from public transit, too. SCHALLER: Across the board in major cities - a couple of exceptions, like Seattle - we're seeing a drop in both bus and subway or metro ridership. SCHALLER: That's not the case. In fact, even with a lot of people using the shared services, you'll see a doubling or tripling of the additional amount of traffic that their growth causes. SCHAPER: Schaller's study suggests that Ubers and Lyfts drive 2.8 new miles for every one mile saved by passengers not using their own car. And he contends that the number drops only a small fraction with services like UberPool. A big reason is that those drivers spend about 40 percent of their time cruising around without customers. The solutions? SCHALLER: One is to put some types of limits on the number of Uber and Lyft vehicles that are in the really congested areas. And the other and really critical thing is to have frequent, reliable and comfortable public transportation. SCHAPER: Lyft and Uber officials take issue with some aspects of the study. In an email, a Lyft spokeswoman says other studies paint a very different picture than Schaller's claims, especially when it comes to shared services. Uber says it agrees with Bruce Schaller's call for more efficient public transit and for congestion-pricing in the most traffic-choked city centers. But, the company calls Schaller's analysis of shared services like UberPool fundamentally flawed. But other studies also show Uber-like services are indeed adding to traffic congestion. Just how much so is not yet clear. P.S. Siraj heads the transportation center at the University of Illinois-Chicago, and he says Uber and Lyft are improving mobility and cities need to accommodate them. P.S. SIRAJ: You don't really worry about who's offering the trip, but how are people going from one place to another. SCHAPER: So rather than restrict ride-hailing services, Siraj says cities need to actively work with them to better incorporate them into their transportation planning. David Schaper, NPR News, Chicago. Transcript provided by NPR, Copyright NPR.